Pre-Trial Diversion (PTD) Denton County, Texas. A Second Chance for First-time Offenders. When someone is charged with a criminal offense and is experiencing their first encounter with the criminal justice system, the process can be daunting. A first-time offender typically has two primary concerns: 1) Will I go to jail? and 2) Can I keep this offense from going on my record? While there may be options available to keep a conviction off of a person’s record, the goal for most first-time (and one-time) offenders is to land in a situation making it possible to erase all records related to the arrest from existence. Under State law (Texas Government Code 76.011), counties are allowed to establish pre-trial diversion programs. Upon successful completion, these programs allow for certain first-time offenses to be discharged and ultimately expunged from an individual’s record. Thankfully many counties across the State take into consideration the fact that a person has no prior history and may have just made a one-time mistake. Denton County, Texas is no different. First-time offenders that have been arrested for certain non-violent offenses may be eligible for a pre-trial diversion program in Denton County. diversion program rests solely with the District Attorney. The District Attorney must approve of each applicant even if all criteria are met. 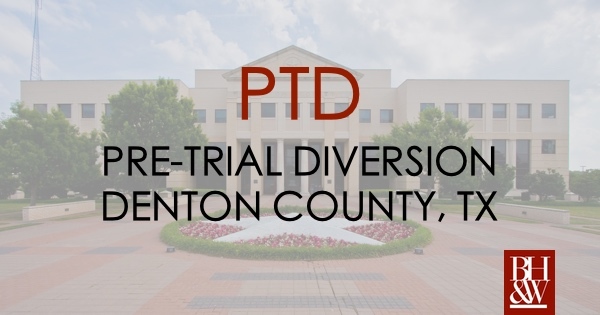 Individuals participating in the pre-trial diversion program in Denton County are supervised by the Denton County Community Supervision Department (DCCSD). Individuals must pay a monthly supervision fee. DCCSD can and will tailor each program to each particular individual. A person may be required to participate in additional classes, community service or other rehabilitative programs as a result of his or her participation in the program. In addition, if any restitution has been assessed in favor of the victim in a case, repayment of that restitution could be made a condition of the program as well. Typically, PTD lasts 12 months, but in some cases, it can be extended to 18 months. Because the District Attorney has ultimate discretion on allowing a person into the pre-trial diversion program, even a person who does not meet the minimum requirements may be allowed to enter into a pre-trial diversion. 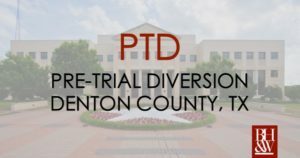 Upon successful completion of the Denton County Pre-Trial Diversion program, the District Attorney files a Motion to Dismiss the case and the case becomes eligible for an expunction.